Betsy Ross sewed it, but did she also design the red, white and blue? 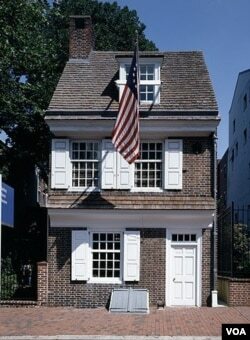 It’s going to be a busy day at Betsy Ross’s house in Philadelphia on Thursday. She won’t be there, since she died in 1836, but hundreds of tourists will be going through her house. 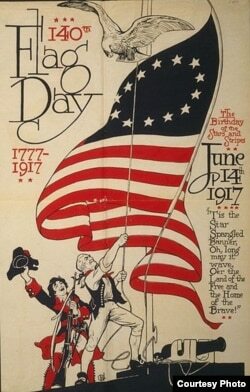 You see, Thursday is Flag Day in the United States. The unofficial holiday commemorates the adoption of the stars-and-stripes design of the American flag by the Continental Congress 235 years ago, on June 14, 1777. According to lore, the Ross House is the birthplace of the nation’s flag. That’s open to debate, but it’s a story that schoolbooks still tell. Betsy Ross was a seamstress, busy upholstering furniture in Philadelphia, which was the focal point of the American revolution against British rule. The Declaration of Independence by the colonists was signed there, and so was the new nation’s Constitution after independence was won. Widowed when her husband, a member of the local militia, was killed in a gunpowder explosion, Betsy Ross often mended the clothes of the rebels’ leader and future U.S. president, George Washington. According to what some say is history and others a stretch of what really happened, Washington asked Ross to design and sew the new nation’s flag. She became a role model for girls - a shining example of women’s contributions to the nation’s history. Most research indicates that Ross did sew the first flag. She’s credited with substituting artful five-point white stars for six-pointed ones in the upper-left blue field. But many other accounts indicate George Washington brought the design to Ross and simply asked her to stitch it together. That’s deeper thinking than a humble seamstress would have come up with, according to those who doubt that Betsy Ross created the first American flag from scratch.